Raj's story goes a little something like this... Beautiful design evokes emotion. Emotion stirs the soul and creates a connection between client, agent and the home buying or selling process. The Boutique Real Estate Group has invested heavily in bringing all aspects of the real estate experience completely in-house. From custom design, professional staging, architectural photography, cinematography and social media to technology, internet optimization & cloud based transaction management. This not only provides The Boutique with complete control of the design, marketing & technology of luxury real estate but also gives them the look & feel of a true boutique marketing agency. This design & tech-forward approach has earned The Boutique Real Estate Group accolades & awards worldwide. In 2016 Raj was named to the prestigious SP200 Honoring The Most Powerful 200 People in Residential Real Estate. The Boutique was an Inman News Innovator Finalist for Most Innovative Technology in 2015, Raj was selected as 33 People Changing The Real Estate Industry by Inman News, Innovator Award Nominee for Most Innovative Real Estate Agent in 2014 by Inman News. The Boutique was also awarded Best Real Estate Video for 2014 and Raj was also named Top 100 Most Influential Real Estate Leaders For 2013 By Inman News. The Boutique Real Estate Group was recently selected as The 2014 Next Generation Real Estate Brokerage by Better Homes & Garden Real Estate & 1000 Watt Consulting. Their 2013 video called #goodbyehello was named Top 20 Real Estate Videos in the USA. As a National & International Speaker, Raj travels the world educating Real Estate Professionals on the value of Technology & Social Media. 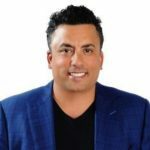 As a highly sought after speaker Raj has taken the stage at some of the most prestigious real estate conferences across the country and Raj continues to make his mark in todays ever changing real estate market.